A half size version of the full mosaic is available here. This one has been a bit of a 'mare to process using my new workflow, designed to protect the colour of the bright stars during stretching, because the focussing was not as tight as I would have liked on the blue subs. My Pentax 165mm f/2.8 was in use in front of the ML16803 and manually focussing it isn't easy, especially when using the blue filter. A normal histogram stretch tends to hide such errors but the V-stretch workflow is quite brutal with such errors. In the end I chose a very low repair threshold (so lots of pixels were included) and a high repair radius. Not ideal and some of the stars still got away from where they should be but with Orion now out of view for me until next season I've had to work with what was available. The bottom half of the mosaic was assembled from 3 x 40 second and 3 x 200 second subs in each of red, green and blue plus 3 x 1,000 second Ha subs. The top half was the same except no 40 second subs. The stars were generated by using "high repair" settings, as previously mentioned, and needed far too much processing to tidy up! The bright nebulosity was extracted using less extreme Repaired HSV Separation Script settings and the Ha nebulosity was "de-starred" before passing both through PI's HDR Multiscale Transform module. Ha colouration was chosen to match the colour of the Horsehead Nebula. I look forward to returning to this subject to gather more and better subs in the future if I can motorise the lens focus in such a way as to allow FocusMax to work it's magic! Wonderful image Bob! I love your technique on stars to preserve their colours. 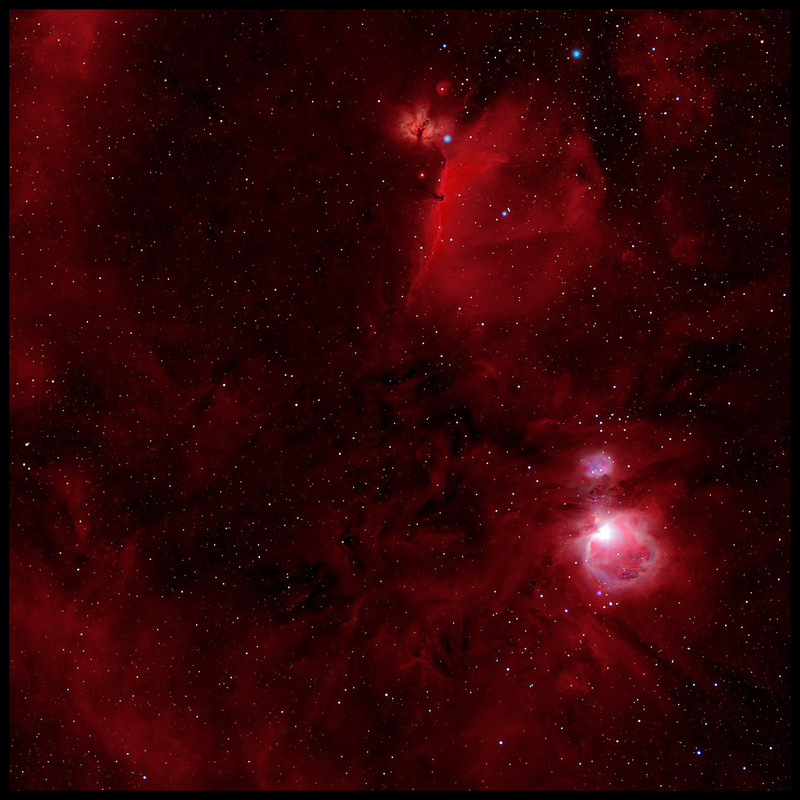 Some may think the image is a bit overly red due to the H-alpha element, but it sure does reveal the massive amount of nebulousity around Orion. PS - if you have a photo of the camera and Pentax lens in action, I'm sure I'm not the only one who'd find it interesting! Gordon Laing wrote: PS - if you have a photo of the camera and Pentax lens in action, I'm sure I'm not the only one who'd find it interesting! There you go, sans power and data cables of course! I designed and had fabricated the U shaped adaptor which bolts to the dovetail plate and to which I can bolt the filter wheel. The filter wheel then supports both the lens and the camera. Since that photo was taken I've also added a power distribution and switching box. Had a final attempt at wringing out the best from a difficult set of data. Not a huge difference but I think this one is better. A 1900 x 2990 pixel version (50%) is available here. As always these images look a lot better viewed against a dark background. 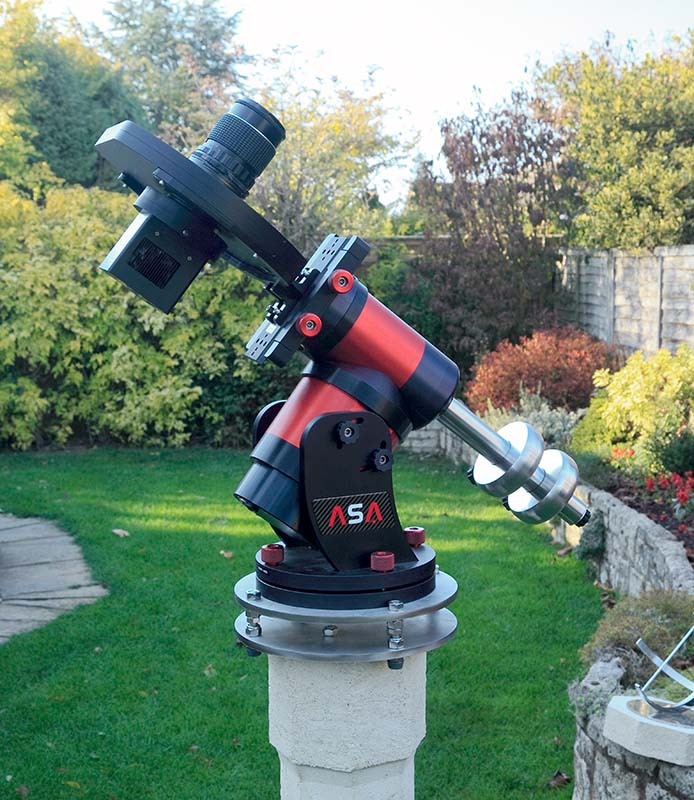 Spring is on the way, together with a new and rather exciting motor in May, so I think it's time to hang up the astrophotography hat for a while, dust off the E-M1 and see if I can remember how it works. Looking at this, I have to wonder if the red is over-done or not? As my point of reference, take the horsehead and flame. In most renditions these are quite obviously different, but there's much less difference here you might not notice it if you don't look for it. Also the nebula between them is usually much whiter but here is again red. Assuming you still do the stars, no stars separation, for the latter how much B+G is there relative to R? 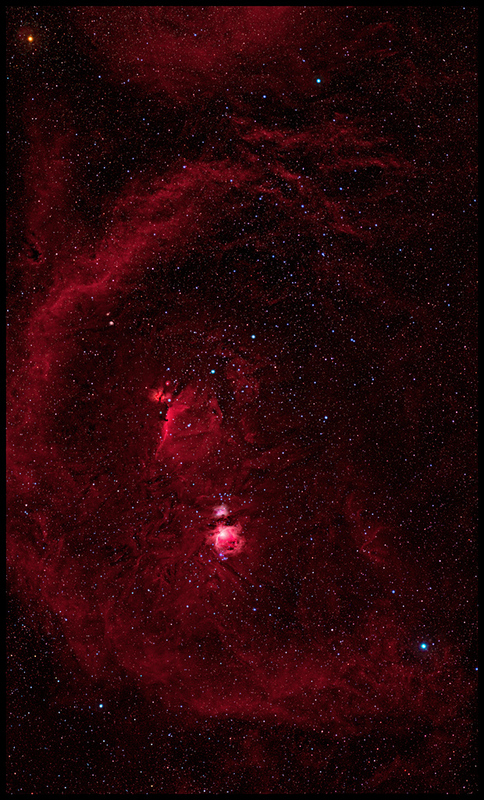 The centre of the Flame Nebula is possibly more orange than one might think looking at the image but the surrounding red seems to trick the eye. When I look at the RGB component image (without the much deeper Ha data) this is quite apparent on my Windows machine with a calibrated wide gamut monitor but as I type this reply on my Macbook Air I see the problem you describe - a white dress/blue dress moment, perhaps? 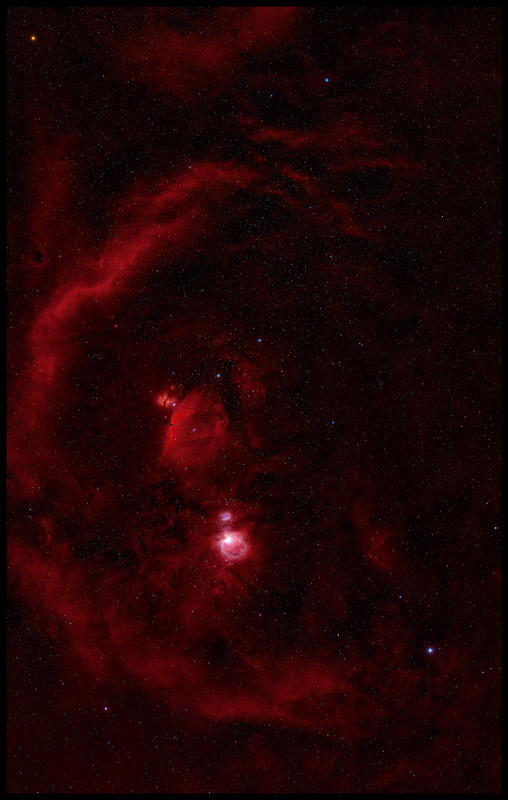 The white areas surrounding some of the nebulosity in the RGB image were a problem as I had to make a decision on how to blend that part of the data with the Ha. I had a very strong Ha signal from the 1,000 second subs and a weak RGB signal from the 200 second RGB subs. I'm not sure there is a single correct way to combine what are essentially two totally different images but maybe I erred too much in favour of the Ha. As for the colour I chose for the Ha, it mirrors pretty exactly the RGB colours found in the brighter parts of the Horsehead nebula. That was what allowed me to do what I hope is perceived as a seamless colour blend in that part of the image. The colour for the Flame, Horsehead and Orion nebulae was done by pasting the brighter areas of the RGB derived nebulosity over the coloured Ha, blending the boundaries as seemed appropriate (big judgement calls there) and using the resultant hue and saturation to colour an image derived entirely from the Ha data (using HSV separations and an HSV recombination). That was an experiment driven by the poorer resolution of the RGB image due to a slightly fuzzy blue channel. Yes, I still do stars/no stars separations. So "No Stars Ha" was combined with "No Stars RGB" as described above and then the "Just Stars RGB" was added. Perhaps I should also mention that the RGB nebulosity colours were what came out of the mix after normal white balancing of the unstretched image in PixInsight prior to using my RepairedHSVSeparation script as usual to preserve full colour during the image stretch. One refinement I've been experimenting with of late is to use some of the R and B signals in the green channel while slightly reducing the contribution of the green signal in that channel to preserve white balance. This slightly decreases saturation and the idea is to compensate for the slightly enhanced saturation which results from the wider than usual separation of my R, G and B filter bandpasses compared to a regular Bayer matrix. While I'm going to take a break from astrophotgraphy for a while I might try and put that technique on a firmer footing using theoretically derived black body data. I like how the different star colors are so easy to see in these types of photos. To the naked eye, they all look white.